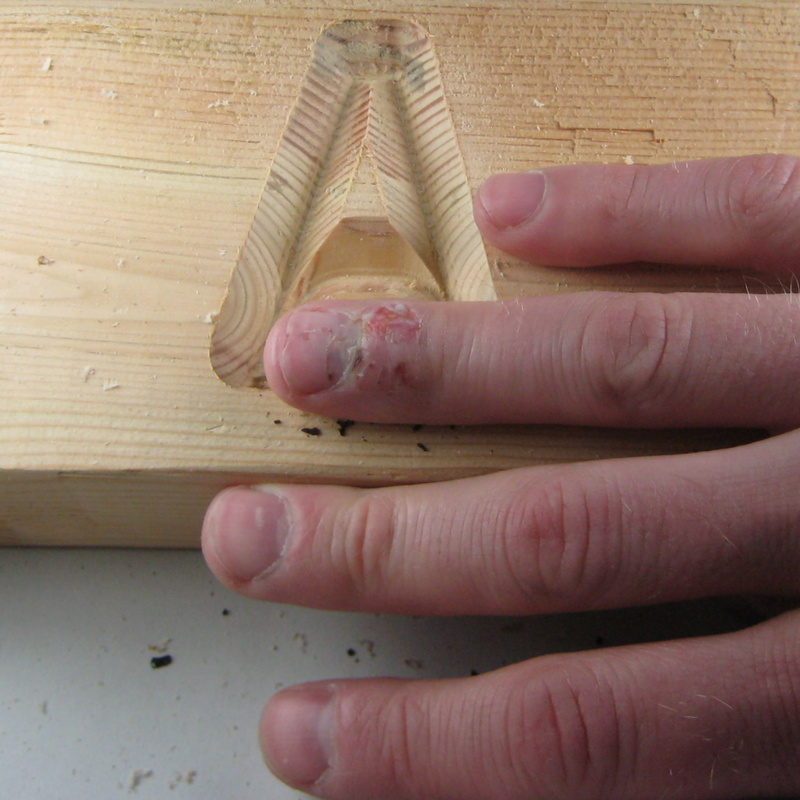 Let me say upfront so that no one worries: my finger will be OK. It’s been a while since I last wrote anything for Ben’s workshop, partially because a dreadful stomach bug passed through our house knocking each family member down for a few days, me going last and getting hit the worst. The other big reason is that I have been dreading talking about my accident. You see I’m quite ashamed because it shouldn’t have happened, but I feel that it’s important to remind people (especially me!) that you can probably get away with a moment of inattention or unsafe practice for a while without consequence, but eventually it will catch you. I also didn’t want to give the impression that I’m some huge risk taker in the shop or that I’m accident prone. As I get older that feeling of being indestructible has been replaced by the sobering realization that we’re pretty fragile, especially compared to our machines. I’ve started wearing gloves while finishing, I wear masks or filters more often, I wear hearing and eye protection regularly and stop to find it if I forget…I try not to get my fingers closer than a hands width of any moving cutter. I was working on making a bunch of switches out of maple for my son’s wooden trains. This was the first time I had used maple for wooden track and expected it to route similarly to the red oak I’d been using. After completing the straight grooves, I set up the router table to cut the curved grooves. I’d picked up the dangerous habit of pushing down on the top of the track piece as it was passing over the router bit. I’d been doing this because it wasn’t easy to set up a feather board for the curved cut on the irregularly shaped switches and my push block kept slipping because it just wasn’t meant for pushing down and moving in two different axes at the same time. As the curved cut I was making intersected the first of the two straight grooves I had already cut, the bit decided that it was going to take the path of least resistance and follow the existing groove rather then cut a new path, so the track flew out from under my fingers and my ring finger bounced off the tip of the router bit several times. It probably never would have happened if I was making another type of piece, what matters is that is happened. I knew right away I had touched the bit, but I didn’t feel anything. I saw that I had all the fingers, so I killed the router and took a look. The bit had dug in in a few spots and then skipped three times on my fingernail. I did a lot of damage to the meat but I could still move it and feel. It looked much worse than it probably was, but I wasn’t in pain so I took a few pictures and went and got my wife to take me to the ER, you can’t be too careful with your digits. My wife was actually home that day so I told her to go get our son out of preschool (he was almost done for the day), and swing back by to pick me up. The emergency room was practically empty, you wouldn’t think it would be full at 11am on a Tuesday. The triage nurse took my vitals and an orderly took me to a room right away. 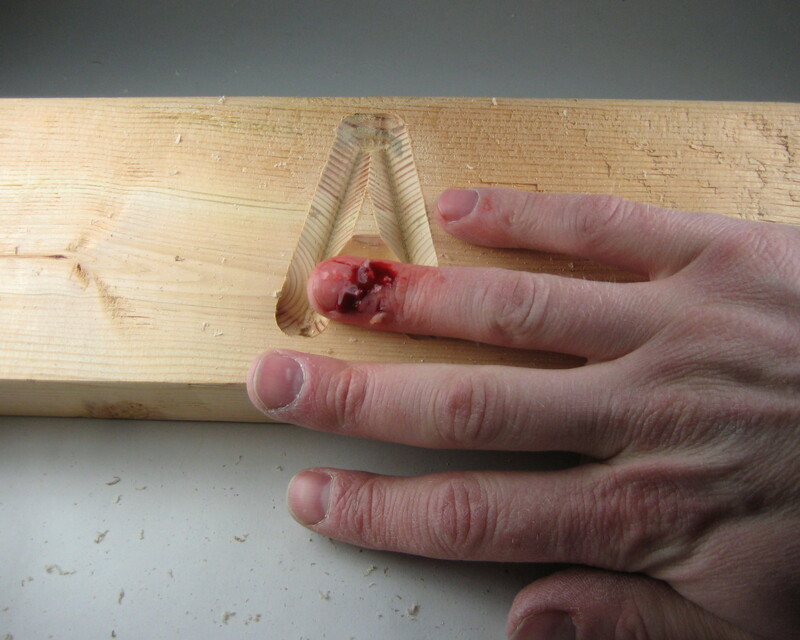 The doctor thought it would heal, but was concerned like I was that I might have broken it. So he ordered X-rays. Unfortunately, it was a two hour wait. In the meantime the orderly cam back and throughly cleaned the wound. As an aside, we’ve been hearing a lot about how table saws are dangerous and that 95% percent of the accidents happen at home. I question the relevance of that number. When I was sitting in the room waiting for an X-Ray, a clerk or receptionist came in and asked me a few questions and asked my permission if they could release the information for anonymous collection. She did not ask me where the accident happened, she asked my how it happened, double checking it was a router. She didn’t ask me if it was at home. She didn’t ask me if I was a pro or hobbyist. So 95% of the cases where they we’re given permission to report happened somewhere they didn’t ask about. Maybe this was something different, but I wonder even more now about how valid these numbers we’re hearing are. 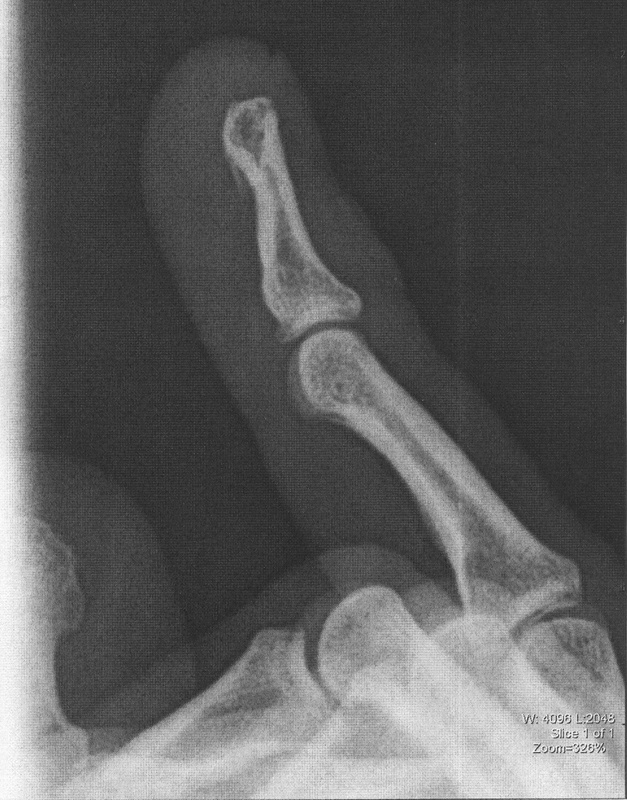 After the X-ray came back he showed me the above picture and said I had knocked a piece the bone off (the little white sliver at the tip of my finger) so it was technically an open fracture and I should take anti-biotics. I just needed to keep it clean and covered until a scab formed. All told I spend about four hours in the ER. After a little more than a week later it’s healed pretty well. I had to stop in the middle of my anti-biotics temporarily for the previously mentioned stomach bug to pass and let me keep something in my stomach, but other than that it’s amazing how fast your body can heal. If you’re really a sucker for gore you can check out my first picture. Glad to hear that you are OK. Accidents shouldn’t happen, but they do because we make mistakes. Luckily this one didn’t have very detrimental consequences. The key is to learn from it, and if possible pass that lesson on so someone else doesn’t have to learn it the hard way. OUCH, that first photo does look pretty gross. Glad that it wasn’t anything major and that it looks to be healing properly! Thanks for your post because as you say, it is easy for me to become to comfortable with my power tools, especially the table saw and my router. Good luck healing your finger and your stomach. Thanks for posting that, photos and all. Some of us (me included) need real-life reminders from time to time not to get casual in the shop, lest we end up a casualty. Glad you’re healing up, and that it wasn’t more serious.